Most offering a private balcony with panoramic views, the 190 guestrooms at Kviknes Hotel are separated into two buildings, a historic wooden Swiss-style wing from the 1910s and a modern building erected during a renovation in the 1970s. Authentic furnishings and thoughtfully intricate decor creates an inviting ambiance for guests. Since its first expansion in the early 1900s, the hotel experienced no shortage of luminaries running through the halls of the property. Today, Kviknes Hotel remains a choice vacation spot operated by fourth-generation Kviknes owners maintaining comfortable and luxurious service and accommodations. 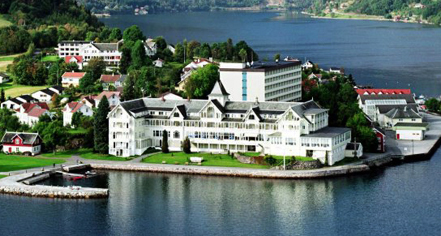 Kviknes Hotel, a charter member of Historic Hotels Worldwide since 2012, dates back to 1752. 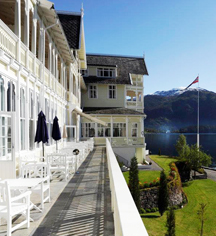 Built in the classic Swiss-style architecture, Ole Kvigne purchased the Holmen guest house in 1877 and was gradually renovated and expanded into Kvikne's Hotel. Extra Person Fees: NOK 510 per person per night. Parking: Self-parking: Available; surcharge. Valet parking: Not available. Originally a modest guesthouse built in a classic Swiss style, the Kvikne family has owned and managed Kviknes Hotel for over 135 years. As the first known hotel in the Sognefjord, Kviknes Hotel is a fine example of warm traditional Norwegian hospitality and service. Learn more about the History of Kviknes Hotel .